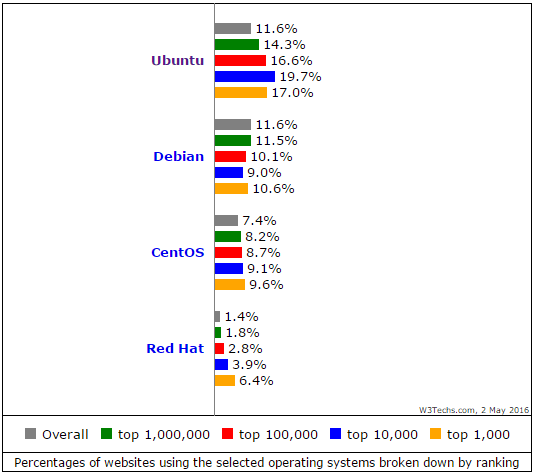 The Ubuntu/Debian clan (Ubuntu is, in its core, Debian-based) have now a clear lead over Red Hat/CentOS. All the other Linux distributions play only a very minor role in the web server market. Taking into account the other operating systems such as Windows and other Unix-variants, the 32.1% Linux market share for Ubuntu translate into a 11.6% share among all web servers. When we started our surveys in 2009, Ubuntu ranked only fifth among the Linux distributions, behind Debian, CentOS, Red Hat and Fedora. It gained steadily from 2.4% to 11.6% today. At the current growth rate, every 2.2 minutes one of the top 10 million websites starts using Ubuntu. Three is a significant amount of fluctuation between web operating systems. Web masters change from one Linux distribution to another frequently. When we look at the changes in the last three months, we see that Ubuntu is also losing sites to other distributions, but overall it is evenly gaining from all its competitors, from Debian just as much as from CentOS and Red Hat. When we drill down into the statistics based on the website's Alexa ranks, we notice that Ubuntu has an even higher share among top 1,000 and top 10,000 sites. 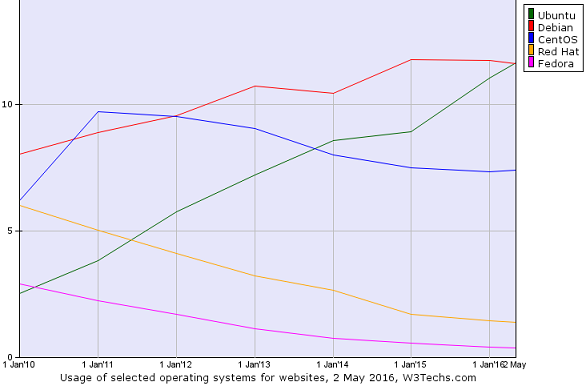 Red Hat/CentOS are doing better among high-traffic sites, but they are still behind Ubuntu/Debian. There is a strong correlation between web server technologies and operating systems. For example, an impressive 80.1% of Node.js sites run Ubuntu. Furthermore 51.3% of Lighttpd sites and 32.8% of Nginx sites. 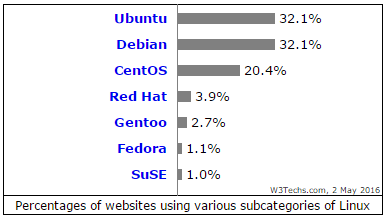 On the other hand, only 8.1% of sites that use Tomcat run Ubuntu, and - obviously - no sites that run Microsoft-IIS. Web hosting providers also have very different preferences when it comes to operating systems. 76.9% of websites hosted by DigitalOcean run Ubuntu, and so are 59.5% of Linode sites and 49.1% of sites hosted by Amazon. At the other end of the spectrum is the GoDaddy Group, with only 1.6% of their servers running Ubuntu. Similarly, there are big regional differences when it comes to web operating system preferences. Ubuntu is strongest in Europe with 30.3% of Latvian sites using Ubuntu, 26.1% of Norwegian and 25.7% of Hungarian sites. 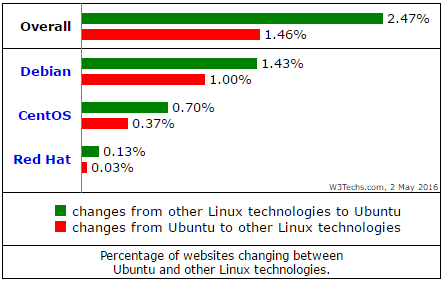 Asia is less Ubuntu-friendly with only 3.3% of Chinese and 2.6% of Japanese sites. Much more details on operating system usage on web servers can be found in our market report.